City buses may one day plug in and charge just like a smartphone. Electric car sales are on the rise, but that's not the only place where electric vehicles are starting to make a mark. Proterra, a maker of heavy-duty electric vehicles, announced Monday that its latest bus can travel between 194 and 350 miles on a charge. Its previous buses maxed out at 193 miles per charge. 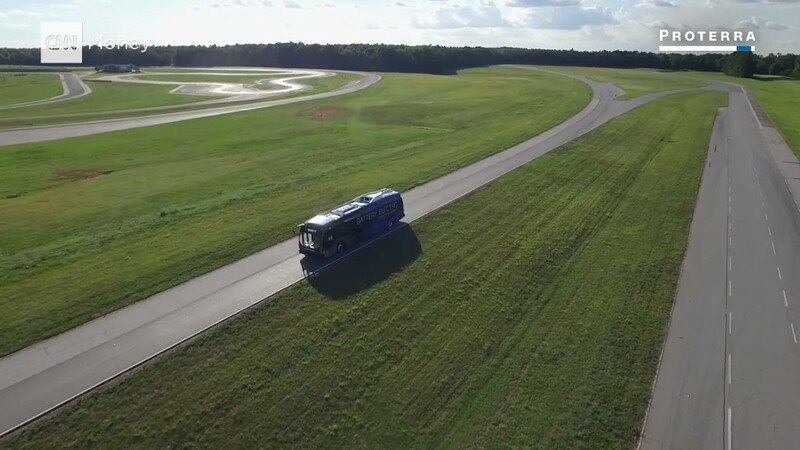 Proterra believes its bus, called the Catalyst E2, is capable of handling the workload of nearly every U.S. mass transit route on a single charge. The bus, which can cost in excess of $800,000, stores up to 660 KWh of energy -- that's 10 times the energy of the standard Tesla Model S.
"We're seeing the beginning of the end in fossil fuels in mass transit," said Proterra CEO Ryan Popple. Proterra's buses are currently in 10 cities, and it has sold more than 312 vehicles to 35 different municipal, university, and commercial transit agencies in North America. The company's 2015 sales matched its sales from its first 10 years combined, according to Popple. Bus companies around the country are slowly warming to the technology. In May, Foothill Transit, the bus operator in the Pomona and San Gabriel Valleys outside Los Angeles, announced its 300-bus fleet would convert to all electric by 2030. Today, Foothill Transit has 17 electric buses, all made by Proterra, that have driven more than one million miles. It received its first electric bus in 2010. The agency's buses have eliminated 2,616 tons of greenhouse gases since then. Another benefit of electric buses is a quieter ride. Passengers won't feel vibrations that come from a gas or diesel engine. Foothill Transit frequently hears from other transit agencies who are curious about electric buses. Spokeswoman Felicia Friesema expects more agencies will turn to electric buses due to improved reliability and maintenance benefits. The key, she said, is to make it a seamless shift for bus companies. If too many infrastructure changes need to be made, going electric is unappealing. "It's happening now," Friesema said of the shift. "I don't know what the tipping point will be."